I think this is my first time reviewing a classical novel and I doubt I’d be very good at it. The book is from a different time, when books were criticized differently as well as written differently. 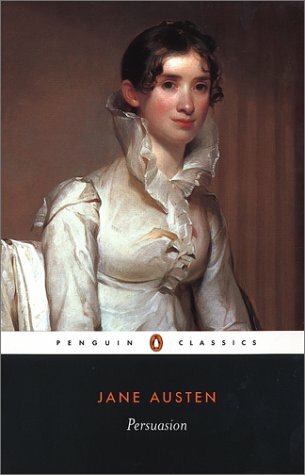 Still, I’ll do my best to give an honest review/opinion of what I thought of this infamous Jane Austen novel. When she was young Anne Elliot was engaged to Fredrick Wentworth, but after some persuasion done by her family members Anne broke off the engagement and has regretted it ever since. After a chance meeting, and several family connections the two meet again, both still single, and both ready to settle down. However, Anne feels he hasn’t forgiven her for breaking his heart and that he hasn’t gotten over the loss either. Honestly, one of the first thoughts that popped into my head while reading this book is that, “This is like the How I Met Your Mother” of Jane Austen novels. And when I say that, I mean even Anne is just a spectator during all these events, hardly doing anything, hardly giving an opinion, just sort of there…telling the story from her point of view. For the majority of the book Anne just seemed so unimportant and insignificant compared to Elizabeth and Elenor in her other novels. It really wasn’t until the end that I had a proficient amount of interest in her, or in Captain Wentworth, who isn’t as charming as Mr. Darcy but he has his good qualities. I will say that the 2007 BBC Adaptation did help in understanding the book a lot better and I do love my movie adaptations. It was pretty good, except the beginning angles of the movie which were…weird. The last 15 minutes of the movie was just SO FAST like crazy fast, it just took away from everything. Should have just made it a two hour movie if you ask me, but I don’t think people in 2007 had much patience haha. Again, not my favourite Jane Austen novel but I was glad to have read it none the less. Maybe I’ll try Wuthering Heights next time I decide to pick up a classic novel. Or maybe Alice in Wonderland.